CILINDRO AD. VAMOS/ADDRESS 65 CC. 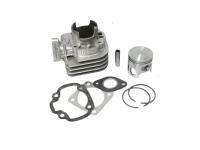 Make sure to select Italkit Performance Cylinders for your racing or everyday riding upgrade or repair job. Italkit high-performance racing parts from Spain! Please check the applications tab list to make sure your model and brand is listed prior to ordering. If you have a question on a Italkit part for a scooter, moped, ATV or UTV please open a support ticket and we promise the team at RP USA will respond promptly, like really really fast.